Gloria A. 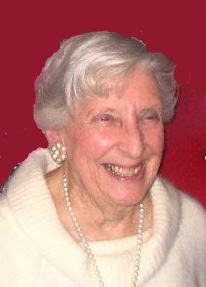 (Guerin) Saumur Ferioli 93, of Cumberland passed away peacefully on April 1, 2019 at the Philip Hulitar Center, surrounded by her daughters. She was the wife of the late Francis L. P. Saumur and Carlo J. Ferioli. Born in Woonsocket, she was a daughter of the late Julien and Rose (Giguere) Guerin. Gloria and her late husband Francis had been the owners of the former Cumberland Manor for eight years during the 50’s and 60’s. She was employed at Bryant University by A.R.A. in The Heritage Dining Room for nine years. She had also worked for many years for her late in-laws Leo Paul and Blanche Saumur, owners of the former Chowder Bowl Restaurant, in Bellingham. She was a former member of the Woonsocket Hospital Aid Association and the Cumberland Library Association. Gloria volunteered at St. Antoine Residence and St. Joan of Arc Church. She is survived by her daughters, Camille Turner and her husband Charles, Eloise DiCesare and her husband Dennis, Melanie Loya and her husband George all of Woonsocket, Judith Dufault of N. Attleboro, and Marilyn Edmonson and her husband William of Charlotte, NC; a sister Fernande Robidoux of Woonsocket, twelve grandchildren and sixteen great-grandchildren and many nieces and nephews. She was also the sister of the late Jean Paul, Marcel, Normand, and Pauline Guerin, Germaine Parmentier, Therese Vachon, Lucille Lambert, Jacqueline Keegan, Suzanne Vadenais, and Antoinette Mailloux. Her funeral will be held Friday, April 5, 2019 at 9:00 AM from the Fournier & Fournier Funeral Home, 463 South Main St., Woonsocket, with a Mass of Christian Burial at 10:00 AM in St. Joan of Arc Church, Mendon Rd. Cumberland. Burial will follow in Resurrection Cemetery in Cumberland. Visiting hours are Thursday 4-7 PM.